Yay! It’s cherry season! The first of the sweet cherries were making their appearance at Saturday’s farmers market. We’re fortunate to live close to a major tart cherry producing region and they’ll start showing up in a few weeks. 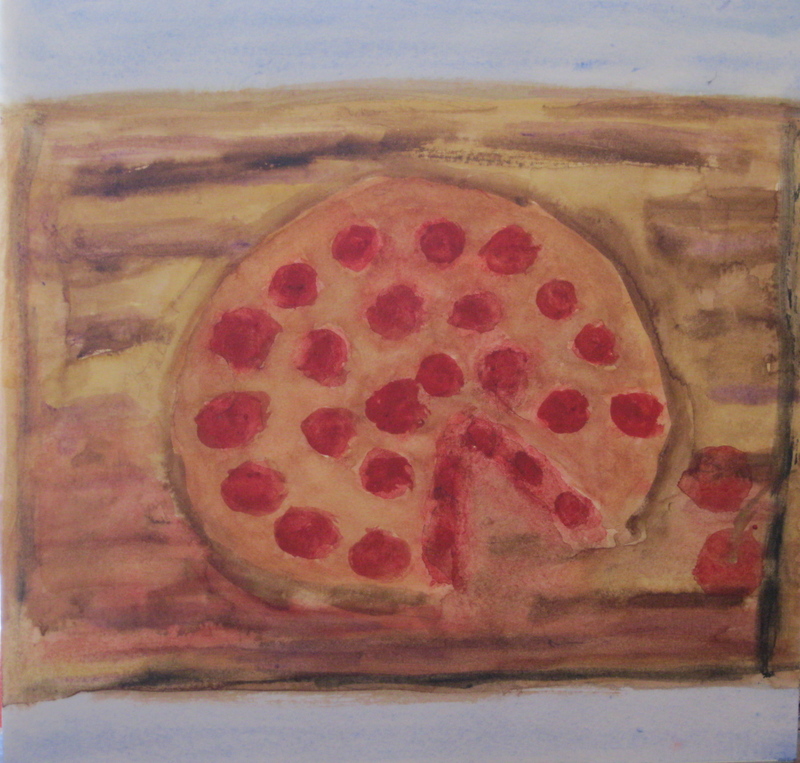 This focaccia of yours sounds delicious, Sharyn, and I like the idea of using almond paste with the li’l red beauties. I’ve a feeling I’m going to make a pest of myself with the cherry vendors again this year. At least I’m consistent. Cherry season is so brief, and cherries are so lovely. Can’t wait to hear what you do with all of those tart cherries, John. Oh man I love fresh cherry season!! We are so behind here in Vancouver…it should be weeks but it feels like it could take forever to come it is so cold! This looks so yummy Sharyn! It is cool here, too, Shira, and may rain tomorrow (It’s not customary for it to rain in June). This is the most delicious new thing I have made in some time. I ate your lentil curry for dinner and am probably going to get another wee slice of focaccia and another glass of milk. 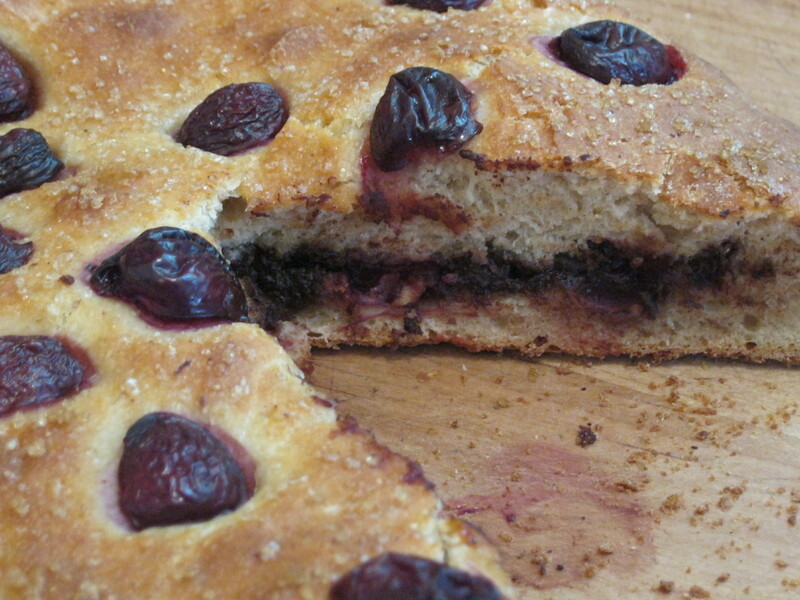 This cherry chocolate focaccia looks absolutely amazing, Sharyn! I’m so jealous of having cherries that are local to use for baking, cooking and eating. I saw some “fresh” cherries in the market the other day and they were $6.99 a pound, imported from CA. I like the suggestion of other fruits and almond paste…I could do that! Here, where they grow, cherries range from $4.50 a pound to $8.50 a pound at the Farmers’ Market. Safeway may have them on special for less. To get them more cheaply, you have to find a farm stand on a highway somewhere or pick your own: I bought three baskets for $13.00 the other day — some for this, some for cereal, some to eat raw. Have to eat them while they are here. You have peaches already — we have to wait for those. Both the focaccia and the cereal are quite good, Debra. If you try the focaccia, you might want to go with bread flour — it is quite the sticky dough, but the finished bread has that wow factor. I’m pretty sure you could make the filling with frozen cherries, CCU, or another fruit. Or you could work with something that is in season for you now. Or you could wait until spring in your part of the world. I’m with you on the taste of cherries in drinks and sweets. Bleurgh! But give me fresh ones and I’ll be happy as punch. The shops have them in at the moment but they are from Spain and I’m waiting for the local ones to arrive before I buy, buy, buy. And although I’m not such an experienced baker as you I wing it as well with the flours – we made flatbreads the other day and the recipe called for strong flour – well a mix of whole and unbleached worked excellently. Your cooler climate puts your seasons a little behind ours, I think, Claire. You will have local cherries soon. Had I had bread flour I might have had to use less flour and might have had less of a mess, but I’ll never know: sourdough is often sticky. this is a delicious focaccia sharyn. thanks for sharing the recipe. bookmarked to make this recipe. cherries are tough to find where i live. may be i will have to substitute some other fruit or berries. Cherries require frost to grow well, Dassana, which might explain why they are hard to find in your part of the world. If you make it, I’ll be interested to see what fruit you end up using. mangoes were on my mind sharyn…. but now its started raining here… in fact it is pouring cats and dogs… mangoes are almost out of season now here. so will have to think what to substitute. Cherry and chocolate are a great combo of flavours that I’ve always liked (black forest cake); it makes me wonder what’s different about this that makes you like it since you seem to vehemently dislike it so much. Is it a dessert or bread? My mom used to make a cherry cake that was very tasty. The painting is rather pretty. Eva, I think that it falls somewhere in between dessert and bread: some people might eat it for breakfast. I think the chocolate puts it in the dessert camp, or as something that you would eat with a cup of coffee or tea in the afternoon or at a brunch. Of course, I ate it for lunch the other day. Why do I like it so much? Well, the cherries on top still taste like fresh cherries because they are three-quarters embedded in the dough. The dough itself is slightly sweet, just enough so that if you get a bite without chocolate or cherries it still tastes good. And I like filled focaccia because it is thinner than the regular thick stuff. I might use an even darker chocolate the next time (as usual, I used what I had). I’ll have to make it with almond paste to know whether it is the chocolate that puts it over the top, but I suspect it is the slight bitterness of the chocolate with the cherries that does it: most chocolate-cherry sweets I have had are cloying. Hm… I don’t think I ever saw a “sweet” focaccia before… they’ve always been rather delicious looking things with oil and herbs, but why not, right? I personally love cherry and chocolate together – I bet this was fantastic… it certainly looks rather delicious! Thank you, Charles. It is good. I had to hide it from myself so that I didn’t eat any for breakfast (I made my blue corn porridge instead), but I’ll be having some with my tea later. Regular focaccia is too thick for me: not flat enough to be a flat bread, not high enough to be bread you can slice. I did like the split effect of this recipe, so, eventually, I may do a savory filled focaccia with sundried tomatoes and feta or something. 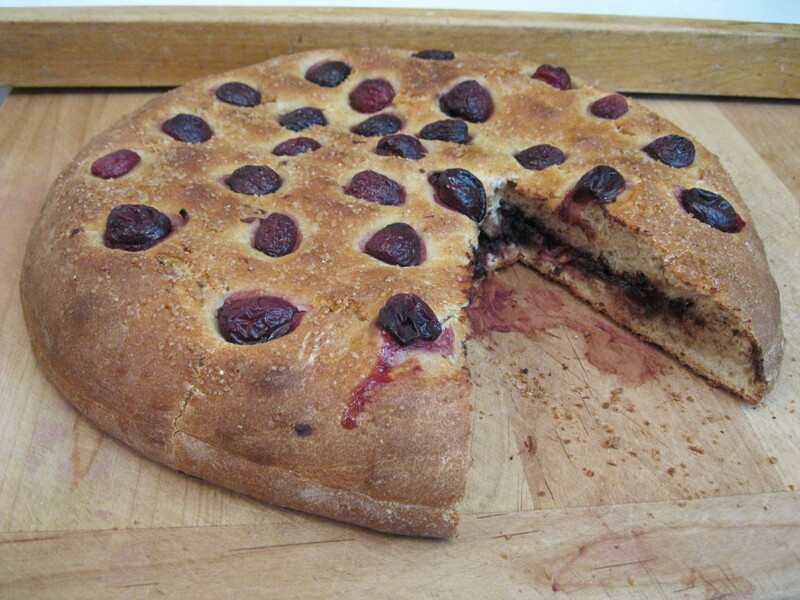 I have had a grape focaccia which was good but since I love cherries this sounds better. In a word….Yum. Cherries are my favorite fruit and can eat them in anything. This sounds absolutely yummy. Thanks, Jane. It’s outrageously good — I think I’m about to have another wedge. Reheating it in the toaster oven makes the chocolate melt and re-crisps the crust. This is the first time I have had focaccia with fruit, other than tomatoes, Karen. Was the grape one sweet or savory or some of each? I know no one who write out a recipe with the level of clarity that you do. I love your writing (and I have said this before); it makes me feel as if I am standing in the kitchen beside you while you pull, flatten, and dimple your focaccia bread. I do have bread flour, and we have cherries appearing in markets in London now. I’m off to NYC for a week but I would love to try this when I return. Thank you, Susan. I’m sure you will eat well in New York. Have a good time! I could almost smell it while reading about your first taste so fresh from the oven. Your disclaimers made me laugh as there are some flavors I avoid because they taste like medicines from childhood. Thank you, Melissa. It was a sticky mess for awhile — I just kept adding flour, prying it up, trying again: a good test of patience and determination. Sharyn, your recipes tempt me to eat things (like cherries) that I would usually never consider. You are a food temptress. “Food temptress,” says Bob. He is right. I want to revise the contents of my cupboard, refrigerator and grocery list every time I read one of your recipes! I especially enjoy foods that offer a variety of textures and complimentary flavors. Good for you for walking away. I do not have that power. In fact, in my imagination, I am standing at your kitchen counter, staring at a bare slicing board! We ate the last of the focaccia today, Granny, at my friend Elaine’s, toasted up in the toaster oven. She said we should make it with fresh apricots and white chocolate. “Ginger in the white chocolate,” I said. She said, “I was just going to say that,” and she hasn’t even read the blog post yet. But I did not originate this recipe — the credit goes to Murrieta — I just amped it up a little bit with the chile-cherry chocolate. I love the idea of a sweet focaccia. And cherries are just perfect. I might give this a go with rosemary and raspberries and a little sprinkle of sea salt. Hmmmm….You’ve got me thinking! Raspberries and rosemary sound exotic, Urvashi, both sweet and savory. Mine was just sweet, both fruit sweet and bittersweet from the chocolate. Thank you for the wonderful recipe, Ed. I hope things are going well.